Looks like WD-40 can be used for lubricating just about any metal parts. Are there non-obvious cases where using WD-40 will be harmful to the stuff lubricated? Firearms - you should never use WD-40 to clean or maintain firearms. Drive chains of any type - because WD-40 isn't a lubricant it really will not work well on Drive chains of any type. Gears of any type - WD-40 doesn't have enough lubrication effect to be useful on any type of gearing. Only specified gear lubricants should be used. Locks - Use powdered graphite or silicon spray instead. WD-40 isn't actually a true lubricant. WD stands for water displacing. The main use for WD-40 is as a solvent and a rust dissolver. The lubricant-like properties of WD-40 are from rapidly evaporating components. It won't last. True lubricants include things like silicone, grease, Teflon, graphite, etc. WD-40 can be good as a first go at things, it can help clean up rust or other grime and then you can apply your lubricant. WD-40 does a lot of things, unfortunately this means that it does not do any one thing well. As a lubricant WD-40 is very thin and runny. WD-40 will lubricate for a short time, but will quickly run off. This is a side effect from it being a penetrant. If it was thicker for better lubrication it would not penetrate well. 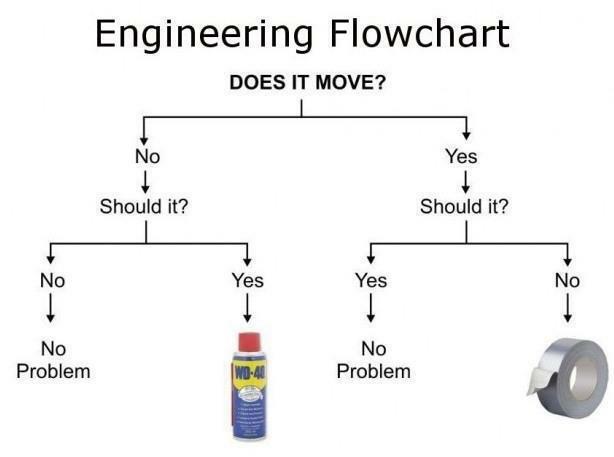 WD-40 is a GREAT quick-fix and one-can option. I use it in that role, it gets things going long enough to let me finish the current task and get back to the shop. Once there I can get to my real penetrants (Kroil, PB Blaster) and my real lubricants (oil, white lithium) and repair the problem. Bonus tip: wrap your WD-40 can with several turns of duct-tape. You now have two of the best quick-fix wonders in one package. Never use WD 40 on door hinges or anything you want to keep clean. It attracts dirt and dust. It will turn your hinge pins black. WD40 is only used as an immediate lubricant, eg. for a stuck bolt, or a s water dispersant. Don't use it where you need longer term lubrication, like a bike chain. Rubik's cubes. Serious cubers will lube their cubes with Jigaloo, CRC silicone, or even vaseline. But, will point and laugh at noobs who use WD-40, as it melts the cube, likely seizing it. Yet people keep doing it. WD40 will ruin a bike chain and the gears wear out quicker. It washes the dirt in, the dirt acts as an abrasive and not a lubricant. My sister works at a music store, and a father ruined an $800 clarinet by using WD-40 on "the squeaky part". Personal experience: An electrician told me never to squirt WD40 into an electric motor (bathroom exhaust fan) as it can be ignited. Lock cylinders. Never in lock cylinders. Doorknobs, padlocks, etc. - the residue left will just attract dirt & grit, and prematurely wear down the works. This was given me by a college friend whose dad worked on the maintenance staff - so they did a lot of locks!! It probably took years to see the pattern, but any lock they had shot with WD-40 eventually failed before un-WD'ed locks. It never should be used on AirSoft or PaintBall weapons as it melts the seals. I read an article once by a clock repairman who described how bad WD-40 is for precision clockworks. The main reason has been given already: it attracts dirt, which acts as an abrasive and eventually gums up the action. For something where you need longer lasting lubrication, consider Silicone-based spray. Comes in a can just like WD-40, but it "sticks" better. It attacks polycarbonate windows such as Tufak or Lexan too. Shooting through a bullet proof window after applying is NOT recommended. For the same reason you wouldn't use it on door hinges, it should never be used for chair and sofa mechanisms. Because WD-40 attracts dust and turns things black, over time that dirt accumulation within the moving parts will build up and eventually start to fall off onto carpeting creating a terrible black mess that is nearly impossible to remove. Don't ever use WD-40 on something that has already been lubricated (like with white lithium grease, etc). The WD-40 will break down the grease and make a real mess. Any electric motor, even if the rotor is stuck from filthy dried-up lubricant! Think squeaky furnace blower motors, fans that won't start up, lawn mower engines, etc. The solvent not only removes any remaining lube, but it can melt coil wires (the lightly-coated copper wires twisted up in electric motors) and cause an electrical short. New fan motor! $200! WD-40 is for displacing water, hence the initials. It's not made for anything else. The rest is marketing spit and sparkle. Seriously if that same marketing team had worked for Jiffy peanut butter, there'd be a can of that on your toolbox instead of WD-40. In every category in which people use WD-40, there are better products. Think of it as the "Harbor Freight universal thing that comes in spray cans" and set your expectations accordingly. It is also notorious for wrecking plastic or rubber. I used to spray it on printer ribbons to extend their life, what I got out of the deal was a delaminated printhead, a $150 part. If you think I'm being cynical, my local gas station has WD-40 for $6.50 a can, and Liquid Wrench for $4.50 a can. There's no reason for that but brand power. Edit: I wasn't quite right. Actually WD-40 was designed for polishing your missile. Seriously. It was made to rub/spray on the aluminum skin of the SM-65 Atlas missile to prevent corrosion. There actually were 40 attempts at the right formula for that purpose. None of which gave the slightest consideration for use as a penetrating oil. Not the answer you're looking for? Browse other questions tagged lubrication or ask your own question. How do I stop a bed frame from squeaking? Why exactly is WD-40 not a true lubricant? How do I fix a Bostitch nail gun that is jammed? How to lubricate a buzzing fan? What are some tips/tricks to garage door lubrication? Is it OK to use powdered graphite to lubricate a garage door opener? What to watch out for when using lithium grease? Why did oiling cause this crank to become dirty? White lithium safe to lubricate a dryer? How to make a toilet seat hinge more stiff? Is it OK to use motor oil instead of household oil for hardware lubrication? Should I lubricate moving parts of electric dryer? If yes, then how?